Your kids, ages 5 and up, will have a blast doodling, drawing, coloring, and imagining as they complete the unfinished pictures that highlight a well-known Bible story or biblical lesson from the Old and New Testaments! Including lessons like: On the fifth day of creation, God made all the creatures that live in the sea. Kids are prompted to help complete the picture with their own doodles and add their own ferocious or silly sea animals! Hours of entertainment and learning go hand-in-hand, as your kids have fun learning about the God's Word while growing in their faith. 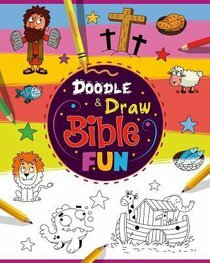 About "Doodle and Draw Bible Fun!"